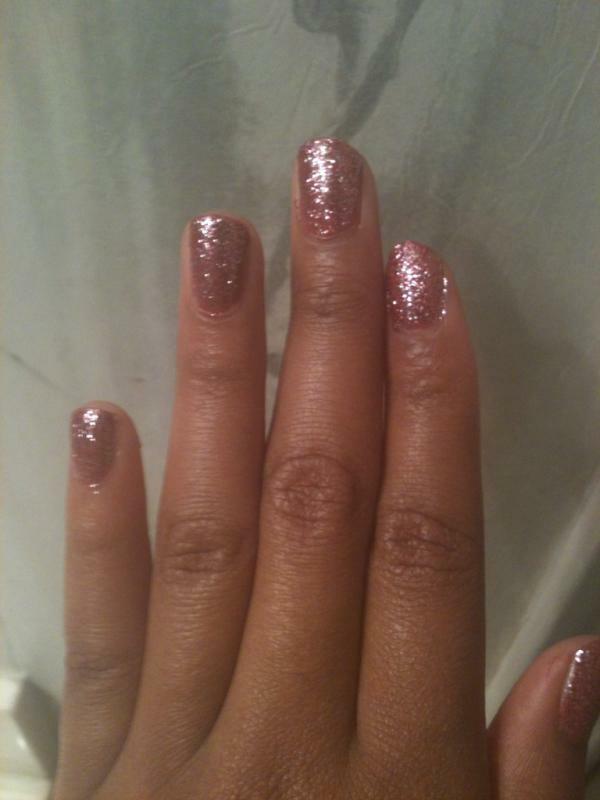 I painted my fingernails and toes the other day and I just love them! 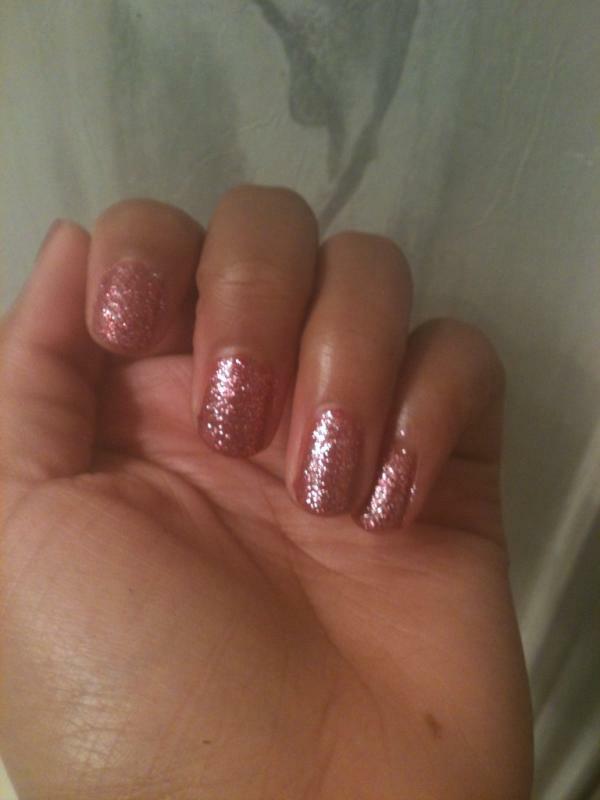 Inspired by all things girly, I used Wet&Wild Sparked and Wet&Wild Casting Call (the color also goes by the name Rose Sage) to achieve my sparkle-y nails and used Wet & Wild Casting Call by itself to achieve the grayish-pink look on my toes. What do you guys think? Love them? Hate them? Whether it be a peter pan style (like the one above) for my girly-girls or a fierce, pointed style for my edgier ladies, the use of collars to emphasize the neckline have come back in a major way. The focus on collars has been seen on teen actress Hailee Steinfeld and various other fashionable celebs. This trend doesn’t just stop at shirts. 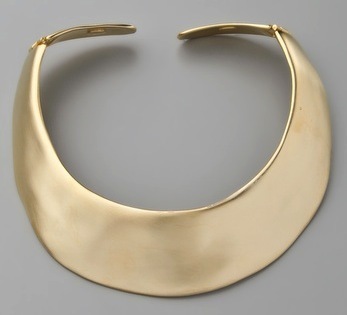 Many collar necklaces have also begun to pop up as a way of adding a fierce statement collar to any outfit. Lastly, the most creative and affordable way people are embracing this trend is through DIY. 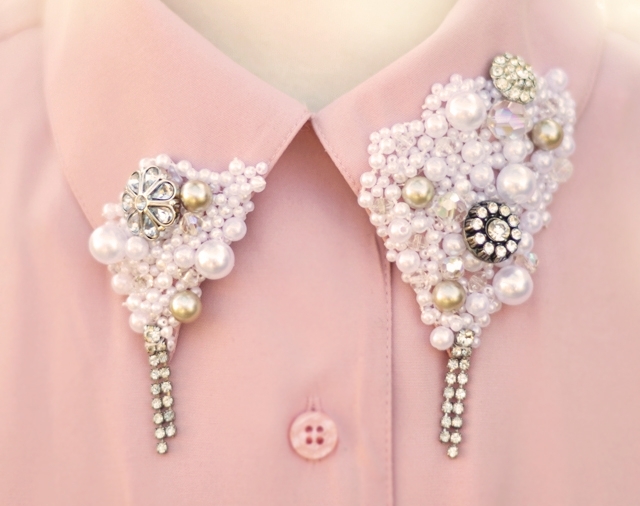 Many have opted to cut the collars off of old button downs and embellish them, using them as necklaces. 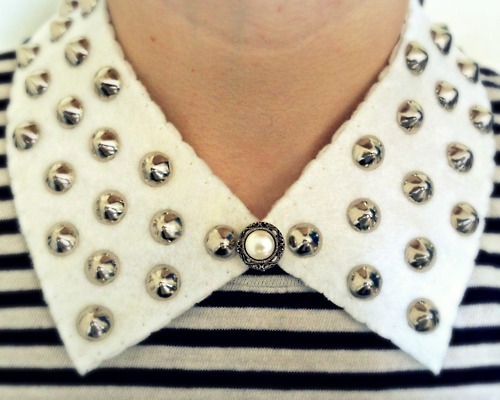 The collar trend is one that can be embraced in almost any style, from classic to rocker chic. And with so many options, collar-style can be embraced on practically any budget! This is a trend-win in my book. 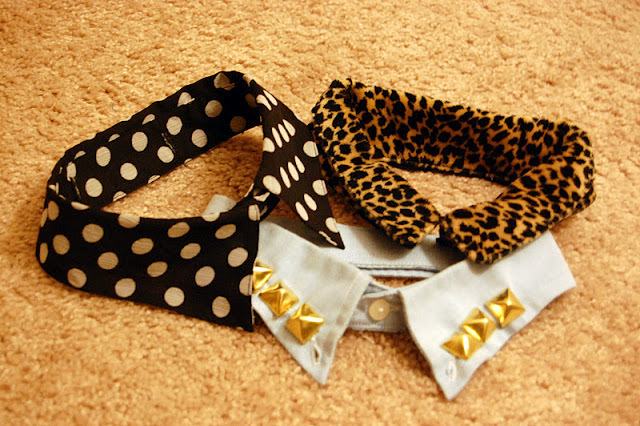 What do you guys think of the collar trend? So I was playing around on Polyvore today and I made a few summery outfits that I would love to share with you guys, along with a few reasons these combos are just right for the warmer weather. Hopefully these looks inspire you and give you some ideas that boost your personal 2012 summer style. Can’t go wrong with a maxi-dress, like ever! This green maxi paired with a statement necklace is an effortlessly cool combo, making you look stylish without trying to hard. Combined with the sun hat as a trendy way to protect from the sun’s rays, in this look, you are ready for a day of fun in the sun. This look is the perfect balance of grunge and girly, The distressed, studded jean shorts and the grunge-style rings, bring the edge to the outfit, while the cool blue color of the sheer top and the floral oxford shoes keeps the look feminine. 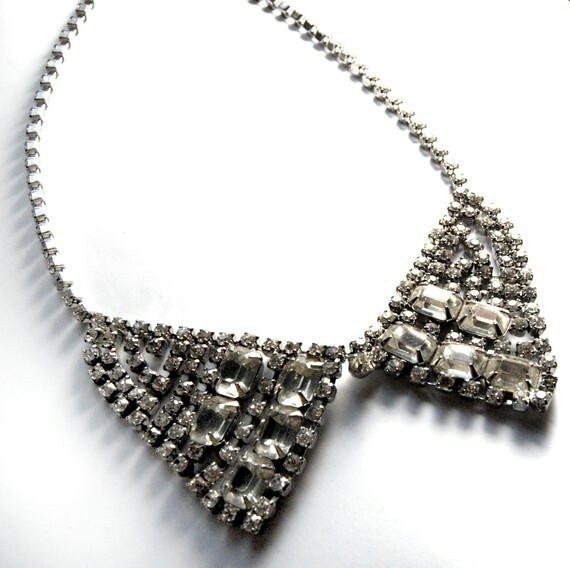 Not to mention that sparkly collar, to die for! Colored jeans and aztec print, need I say more???? Both are really big this summer and they really compliment each other in this combo. The jeans provide just the right, bright pop of color and the aztec print makes the look funky and fun! Gold accessories accent the look. Effortless and boho-chic come to mind when I look at this outfit combo. The cut of the skirt and the slouchy white tank give a relaxed vibe. The denim vest and gold jewelry pull it all together by keeping it from giving and overly relaxed vibe but keeping it simple and laid back. The best part about this look in my opinion? The neon, waterfall skirt. Neon, IN. Waterfall cut, IN. and for good reason. Also, the turquoise pop of color in the cuff seemed very complimentary to the neon skirt in one of those ways you can’t explain. You just know its right. I love everyone of these summer looks! Of course I may be slightly biased since I created them. However, I believe they capture the essence of this summer’s style. Which one was your favorite? Comment & let me know! 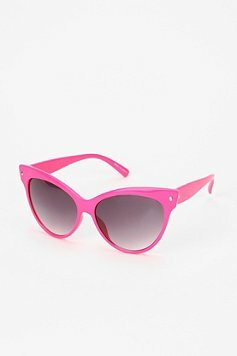 These bold pink “South of 5th” sunnies from Urban Outfitters are perfect for the season! 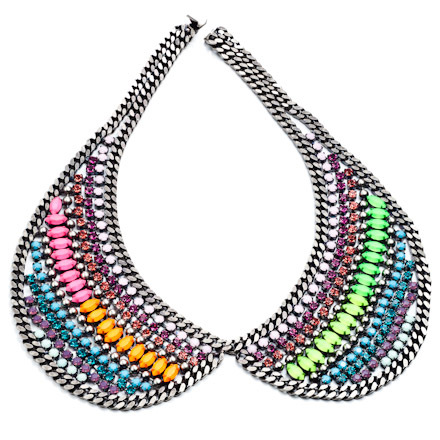 Wear them with any outfit for a bit of neon flare. They run about $16 and they are cat-eye glasses, a trend bonus! Taking summer school maybe? I am, and Lord knows I will need a way to carry around my books. I could just use one of the handy shoulder bags I already own (that’s probably what i’ll actually do), but in my fashion fantasy land I’m walking around the campus with this baby on my back. 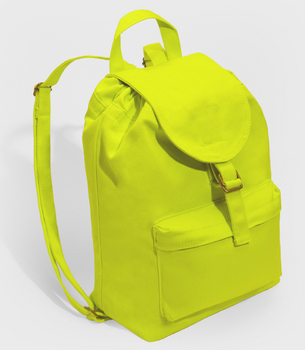 I’m not too often a fan of backpacks, but this one screams chic.On sale for $29.99, this Baggu Neon Backpack can be purchased on fredflare.com. 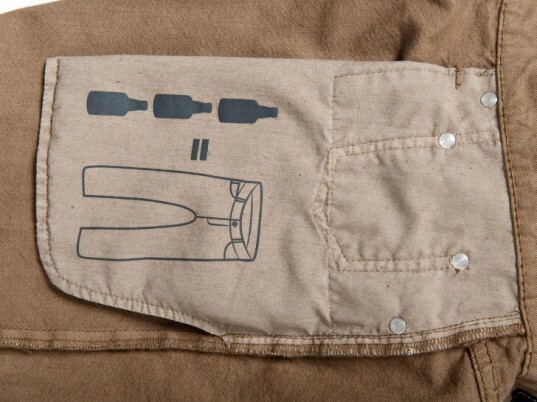 Lastly this bag was made from 100% recycled cotton canvas, an environmental plus! Neon polish, oh yeahh! 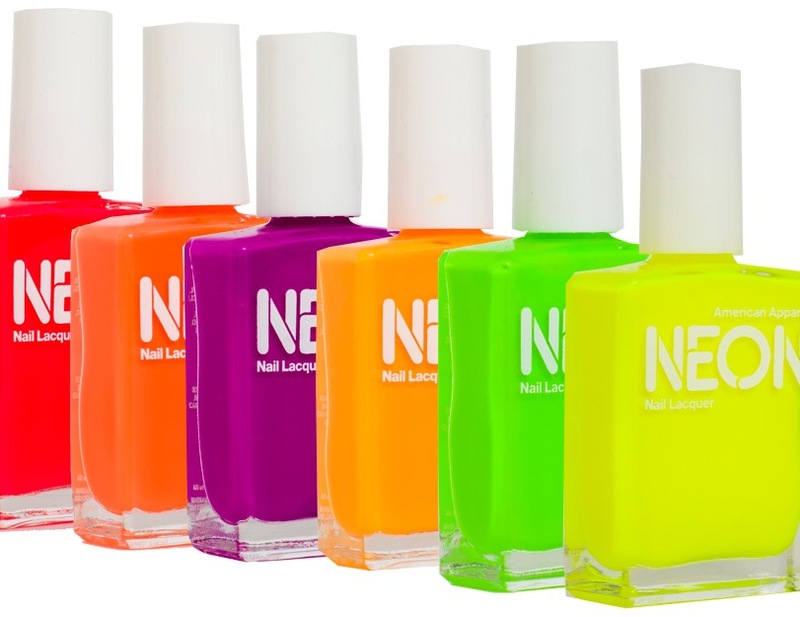 Probably the cheapest way to sport the neon trend, this nail polish and others like it only run about $4 and can be found in drugstores and your local Walmarts’ and Targets. I will definitely be getting some and putting it into effect ASAP! Have a little fun with neon yourselves! Upcycling is a new movement on the rise in fashion design where designers acquire previously used pieces or fabrics and update them to fit styles of today. Many designers see upcycling as a way to help the environment while catering to the popular demand for vintage style clothing and accessories. Many businesses have been started based on this design trend. Sites like acidlace.com and recycleboutique.co.nz are examples of these. Etsy.com also features a number of sites that host individuals selling their own upcycled pieces. Many people have taken to upcycling clothing because of its affordability. Used fabrics, old items, thrifted items, can all be turned into new trendy additions to ones wardrobe, with a little DIY and an even lesser amount of cash. This is the beauty of upcycling in the more individual sense. Designer and creator of Vancouver’s Eco Fashion Week, Myriam Laroche, shares her sentiment for more environmentally conscious trends in fashion. “Responsible fashion is about the treatment of people and the earth during the entire garment-making process,” said Laroche. ‘Responsible fashion’ seems to be very necessary since according to the Fair Companies blog, more than 20 million textiles are thrown away in the U.S. each year. Though upcycling may seem like a small, possibly insignificant act toward environmental health, as it gains popularity, it actually may make more of an impact than expected. According to Worn Again, a blog dedicated to upcycling in the UK, every ton of discarded textiles reused saves 20 tons of C02 from entering the atmosphere. With statistics like these, as well as more and more designers becoming earth concious in their work, it is highly possible that the continuance of the upcycling trend can significantly decrease waste and its harsh environmental effects. What do you guys think, should I do it? Will you all do it with me?